“Flat in a changing world” was how Andreas Schleicher, head of PISA, summed up the UK’s results – a conclusion which is difficult to refute. It is an inditement of political arrogance, the punitive control of teachers, schools which are drowning in data, and a sharply divided society in which many young people are losing hope. Education ministers were ruthlessly determined to “win the global race” in school test scores. They bullied teachers into accepting impossible workloads, piled pressures on children through a relentless accountability system and coerced hundreds of schools to become academies… so what has changed? Very little. The new PISA ratings are more or less identical with PISA 2006. Science was one of the few success stories of the original National Curriculum 25 years ago. It was established as a double subject, compulsory for all. This removed a major source of gender disadvantage, so that girls could no longer drop out of physics and chemistry. Science is also a strong part of the primary curriculum. Maths is a particular problem, given its importance in science, technology and many other field. 18 countries had an average score at least 10 points higher, and some of the East Asian countries were more than 20 points higher. 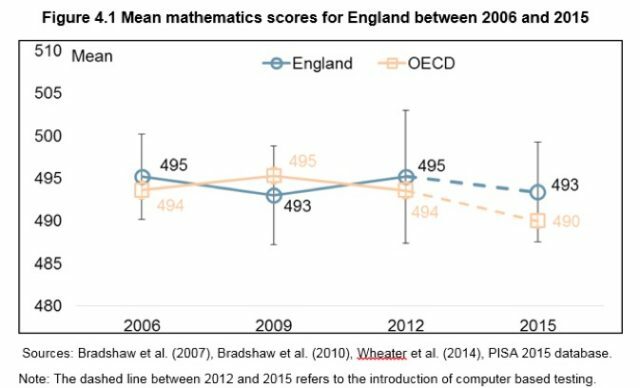 PISA also shows a massive gap in England between higher and lower attainers, largely the result of the economic and social divisions in our society. En science depended disproportionately on elite private and selective schools for the higher scores. Finland has enjoyed remarkable success since the first PISA in the year 2000. Its education system has no school inspectors, no external exams until age 18, no performance pay for teachers, no standardised tests or league tables. Children begin school at age 7. Almost all its schools belong to the local community and are subject to democratic control. Secondary schools are small (average 300). There is well resourced early intervention. Excellent school libraries help turn teenage boys and girls into keen readers. Teaching is a respected and attractive profession. Last but not least, its teachers are highly qualified, graduating from a five year undergraduate course with a Masters degree in education and academic subjects. Despite antagonistic predictions of a fall from grace by advocates of the English system, Finland remains one of the top scoring OECD countries. In science it shared the highest ranks with Canada, Estonia and Japan. In reading it was just one point below highest scoring Canada. In maths it took 7th place among the 35 OECD countries. It scored about 20 points higher than the UK in all three subjects. The highest scoring country in all three subjects is Singapore, with a small population but advanced economy. Three quarters of 25-40 year olds (i.e. most parents) are university graduates or have a professional diploma, giving an enormous educational advantage to their children. Teachers come from the best qualified graduates. The pupil-teacher ratio has been cut from 16 to 12 in secondary schools, and 19 to 16 in primary schools, in the last five years. Some territories within or near China also did very well in science and maths, but this needs further analysis. If children across China were tested, the scores are buried. The stellar performance of Shanghai in PISA 2012 turned out to be largely a consequence of 1 in 2 pupils being denied any education after the age of 14 because they were the children of migrant workers (mainly less skilled workers with limited education). By the age for PISA testing, they had either returned to their family’s place of origin or begun work. The remaining children were also subject to very high levels of tutoring. We do not yet know whether this applies to Beijing or Hong Kong. PISA causes major problems across the world. Reactionary politicians tend to use bad results as the basis for a moral panic, in order to impose even worse decisions. School systems are driven to prioritise reading, maths and science, to the neglect of other parts of the curriculum. PISA’s international tests can lead to other aims of education being marginalised. Sometimes comparisons are made by expert statisticians who don’t understand specific circumstances. At the same time, the data is thoroughly analysed and can be revealing. Like all such data, it should raise questions but not be assumed to provide the answers. The data can be used as evidence to challenge harmful policies. The latest PISA data certainly exposes the futility of an accountability system in England which is driving excellent teachers out of their profession. This entry was posted in Accountability and tagged accountability pressures, National Curriculum, politicians, Shanghai, testing. Bookmark the permalink.